UP B.Ed Entrance Exam Online Application Form:- Mahatma Jyotiba Phule Rohilakhand has been upload the applications for UP B.Ed Entrance Exam 2019 for the academic session 2019-21. Students who want to enroll for B.Ed Joint Entrance Exam should check the UP B.Ed Entrance Exam Notification 2019. Applicants can get the complete details of UP B.Ed JEE like as eligibility criteria, online form, admission process etc from the post given below on this web page. The MJPRU is responsible to conduct the UP B.Ed 2019 Entrance Exam for providing the training of teacher. Applicants whose want to appear in UP B.Ed Admission they all have check the UP B.Ed Entrance Exam 2019 Notification and have to qualify this examination. There are various aspirants who want to admission in the UP B.Ed. If you are also one of them, then you are on right page. We have provides below complete details regarding UP B.Ed Entrance Test 2019, Application Form, Exam Date, Eligibility, Syllabus, Admit Card, Result etc. Generally the UP B.Ed Exam Application Form has been release on 11th Feb. Same this year the examination authority announce the Exam Notification of UP B.Ed. Before fill the Online form, Candidates can check the UP BEd Entrance Exam Eligibility. They will be able to apply UP B.Ed 2019 Application Form from 11th Feb 2019. Applicants should apply online before 11th March, because after last date, officials will not be accept any application form. They should be careful on the time of online application making. Only those application forms will be accepted by officials which will be completed correctly in all respects. They have to register first and after that they will be able to fill UP B.Ed JEE Application Form 2019. Applicants firstly check the UP B.Ed Joint Entrance Exam 2019. The Exam Authority announce the exact dates. It must be noted that these dates are confirmed. Only Indian applicants apply the form. Applicants are needed to fulfill the status of local resident & domicile criteria. Candidates must have passed their Graduation from a well repudiated university in UP or any central university with 50% minimum marks. If applicants have bachelor with B.Tech or B.E, they need to get 55% marks in mathematics, Science and other subjects to apply for the test. The age limit of the applicants have minimum 21 years. The payment also be made through credit or debit card also. Candidates can fill the application form directly through the MJPRU official site. Fill the mandatory fields carefully and correctly in the application form. After fill the UP B.Ed Entrance Exam Application Form 2019, pay the application fee. Attached the Demand draft and send this to the University address. The JEE B.Ed Entrance exam will consist of Objective type questions. There will be negative marking of 1/3 mark for each wrong answer. For every correct answer 02 marks will be awarded. 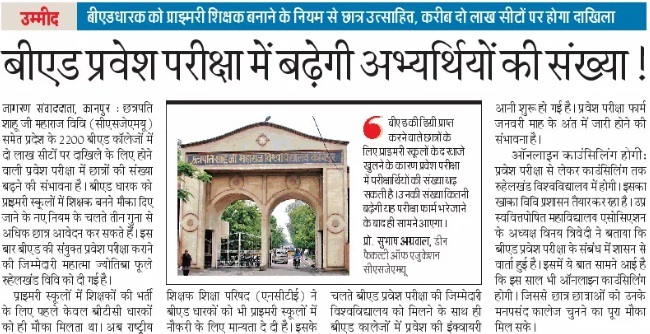 This examination will be conducted by MJPRU University in coordination with Uttar Pradesh government. Authority will conduct this exam in approx major cities of Uttar Pradesh this year. We are providing you an absolute idea about expected exam centers of this year. The eligible aspirants will be selected on the basis of their performance in entrance examination followed by UP B.ed counselling 2019. Admission will be done only on state level merit. Private and govt. colleges will consider the Bed scores for admission in B.Ed. Course. For more details and queries about UP B.Ed Entrance Exam Notification 2019, the candidates can visit the official website.